ALBUQUERQUE, N.M., March 8, 2010 — The Boeing Company [NYSE: BA] today announced it has begun offering a new, compact, energy-efficient camera that provides three-dimensional images for military and commercial applications. Boeing Directed Energy Systems and wholly owned Boeing subsidiary Spectrolab have jointly developed the camera using their own research and development funding, and successfully tested it over the past two years by attaching it to mobile ground platforms and a Boeing AH-6 Little Bird helicopter. 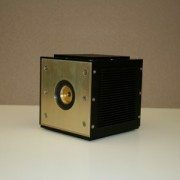 Equipped with advanced sensors that were developed by the Massachusetts Institute of Technology’s Lincoln Laboratory and transferred to Boeing under a teaming arrangement, the cube-shaped camera is one-third the size and uses one-tenth the power of most comparable 3-D imaging cameras. The camera, which Boeing can customize for each customer, has many potential uses, including mapping terrain, tracking targets and seeing through foliage. To create a 3-D image, the camera fires a short pulse of laser light, then measures the pulse’s flight time to determine how far away each part of the camera’s field of view is. “The camera combines cutting-edge sensor technology with Boeing’s advanced pointing and tracking solutions and real-time processing to provide our customers with highly integrated 3-D imaging payloads for ground, airborne or space-based applications,” said Joseph Paranto, Growth lead for Directed Energy Systems in Albuquerque. The rapid speed at which technology is advancing seems to amaze me every single day and today is no exception. Below is a video demonstrating ongoing research being done out of the Georgia Institute of Technology funded in part by a Google Research Award. Be sure to watch the video at the bottom of this post. Below is some information from the research site. Today’s most popular class of laser scanner – ScanStation™ – is now in a compact, all-in-one ScanStation C10 platform. It includes scanner, tilt sensor, battery, controller, data storage, auto-adjusting video camera and laser plummet. ScanStation C10 also features major productivity advances, including a new Smart X-Mirror™ that lets users conduct full-dome scans in literally just minutes using a spinning mirror. With outstanding performance for site, exterior, and interior applications, ScanStation C10 makes High-Definition Surveying™ (HDS™) profitable for even more as-built, topographic and monitoring surveys. The ScanStation C10 platform represents the most capabilities and best value packed into a single laser scanner instrument. Users can take advantage of surveyor-friendly, onboard total station-like control or use an external laptop for even more powerful, onsite viewing and data processing. ScanStation C10 combines all-in-one portability with the ability of users to traverse, resection or use scan targets for maximum flexibility in dealing with site logistics. Full 360º x 270º field-of-view, high accuracy, long range (300m @90% reflectivity), and high scan speed (50k pts/sec) add to ScanStation C10’s position as the industry’s most versatile scanner. (Heerbrugg, 21 July 2009) Leica Geosystems announces the immediate availability of Leica CloudWorx™ 1.0 for SmartPlant 3D. This powerful and easy-to-learn point cloud solution is designed for Intergraph SmartPlant 3D users who want to take full advantage of accurate, laser scan as-built data directly in SmartPlant 3D. Leica CloudWorx™ 1.0 for SmartPlant 3D is the latest addition to the Leica CloudWorx suite of products that enable professionals to use rich, as-built point cloud data directly in their native desktop design and visualization platform. SmartPlant 3D is Intergraph’s next generation plant design platform. Leica CloudWorx for SmartPlant 3D is based on Leica Geosystems’ long proven database-centric Cyclone™ point cloud foundation, which allows users to simultaneously benefit from state-of-the-art spatial accuracy and high performance point cloud management. Leica CloudWorx for SmartPlant 3D provides several ways to quickly, efficiently, and effectively manage vast amounts of point cloud data. User named and defined “Cutplane Slices and Half-Space Sections” and/or “Limit Boxes” provide a quick and easy way to navigate point cloud data. These selections can be recalled as needed on demand. The Key Plan and TruSpace viewpoint management tools provide unsurpassed ease-of-use and improved visual comprehension. Measurements are taken using familiar SmartPlant 3D measuring tools. Clash detecting against point clouds with Leica CloudWorx is performed using SmartPlant 3D’s own automated clashing and reporting tools. 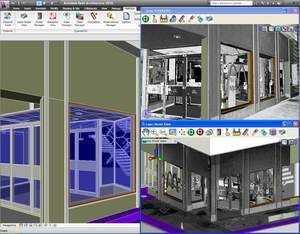 Users can automatically detect clashes between modeled objects and point clouds, based on a user’s own defined tolerance settings. All interfering points within a user-defined region are visually highlighted and itemized. Leica CloudWorx for SmartPlant 3D lets Intergraph’s users take advantage of spatial scan data from any laser scanner via industry-standard ASCII-based data formats. In addition, Leica CloudWorx for SmartPlant 3D directly accepts, without any data format conversion, compact native data formats from the industry’s most popular scanners. These include all models of Leica Geosystems High-Definition Surveying™ (HDS™) time-of-flight and phase-based laser scanners, and selected scanners from other vendors. This capability to accept native formats from the industry’s most popular scanners provides users with even higher overall system efficiencies and simpler workflows. Leica CloudWorx 1.0 for SmartPlant 3D is immediately available from Leica Geosystems. Pricing information is available through appropriate Leica Geosystems representatives and dealers worldwide.